It’s been a green week, with nothing but good news. 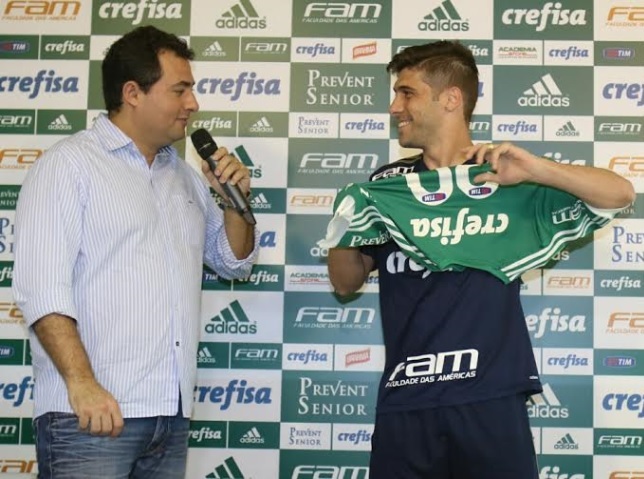 Offensive midfielder Fellype Gabriel finally pulled on the jersey, now legally a Palmeiras player and in condition to play for the club. Signed in May, the 29-year-old was awaiting legal matters to settle with his former club Al Sharjah, from the Emirates. Having trained with the Palmeiras squad for more than two months, Fellype hasn’t played a game in nearly a year due to a series of injuries sustained while at his former club; the most serious being one to his left knee. The carioca’s international career includes three seasons with Kashima Antlers of Japan. In Brazil, he has previously played for both Flamengo and Cruzeiro. Contract with Palmeiras running until end of 2017. Welcome and good luck, Fellype! Another piece of excellent news: striker Leandro is leaving the squad, having been lent to Santos for the remainder of the season. Although considered very promising at first, the kid never took off at Palmeiras except for that short spell in the first months of 2013, which even rendered him an opportunity with the National squad. Leandro gets on palmeirenses’ nerves, his apparent lack of emotion and motivation possibly being the primary source of frustration. Come think of it, he rarely seemed happy at the club. Good for him he is moving on, good for Palmeiras. Hopefully, Santos can spark his return to good form, enabling Palmeiras to cash in if/when he transfers permanently to Santos or any other club. Palmeiras have launched their official app. “What took them so long?” is a justified question. Nevertheless, now it’s here and it was worth the wait: the app is excellent. Available for iOS and Android (sorry, Portuguese only for now), it’s fast, sporting a great user interface and loaded with information. I like it a lot. And with more than 200.000 downloads in the first week – already occupying first position among Brazilian football club apps – it’s rather safe to assume you will like it too. Speaking of breaking records: last Monday, Palmeiras made available the tickets for Sunday’s 11 o’clock game against Atlético Paranaense. By Wednesday, they were all gone. Every single one, and all sold through the internet, which is a first in Brazilian football. Congratulations, Palmeiras. And congratulations, palmeirenses, once again showing the why’s and how’s of Palmeiras being the team with the highest attendance average in this year’s Brazilian championship. Two games from this the 16th round were played already on Wednesday, curiously enough both games involving the two contenders currently ahead of Palmeiras in the tables. Atlético Mineiro beat São Paulo 3-1, while Corinthians beat Vasco 3-0. Meaning Palmeiras must really bag the three points on Sunday. When things go well, everybody wants a piece of the cake, and that applies even if you’re a Cake Boss. A couple of weeks back, against Santos, Buddy Valastro and family were at the Allianz Parque, for the first time enjoying a game of football in Brazil. No wonder the Italian-American celebrity chef chose a Palmeiras game, while in São Paulo to oversee the production of a Brazilian version of “Cake Boss”. Welcome to the family, Buddy!